Enjoy the power of Shadow on the big screen. 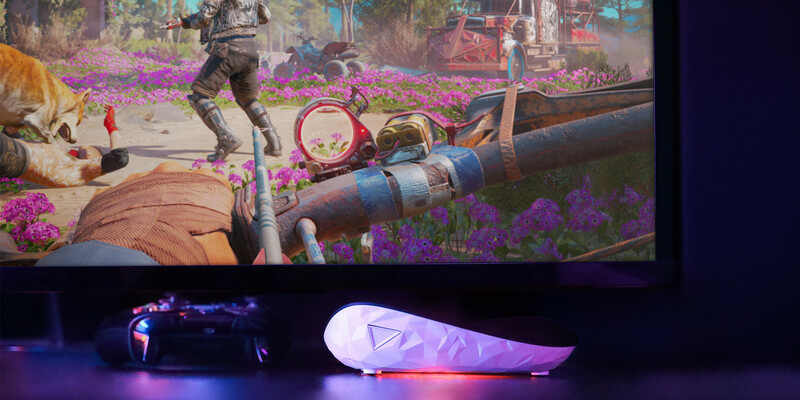 For those who want the best Shadow experience in their living room, Shadow Ghost is the the perfect way to bring a high-end gaming computer to your TV. Forget about setting up a bulky PC tower. Simply log-in to your Shadow account and make the most of all your PC games in full HD, and even 4K UHD, with a gaming setup that fits in the palm of your hand! Unlike a regular gaming setup, Shadow Ghost is absolutely silent, designed to be fanless. We’ve made Shadow Ghost discrete and stylish with Bluetooth and Wi-Fi connectivity, to fit right in to your TV environment. And yet you’re still enjoying the full power of a high-end machine. The reason for that is simple: Shadow Ghost contains only the necessary hardware to log you in to your Shadow account and connect your favorite accessories (gamepad, keyboard, mouse,etc.). All you’re doing is sending your input and streaming back the result! Shadow Ghost works with all your peripherals and makes connections easy via Bluetooth and Wi-Fi. It supports resolutions up to 4K UHD 60Hz through HDMI 2.0.